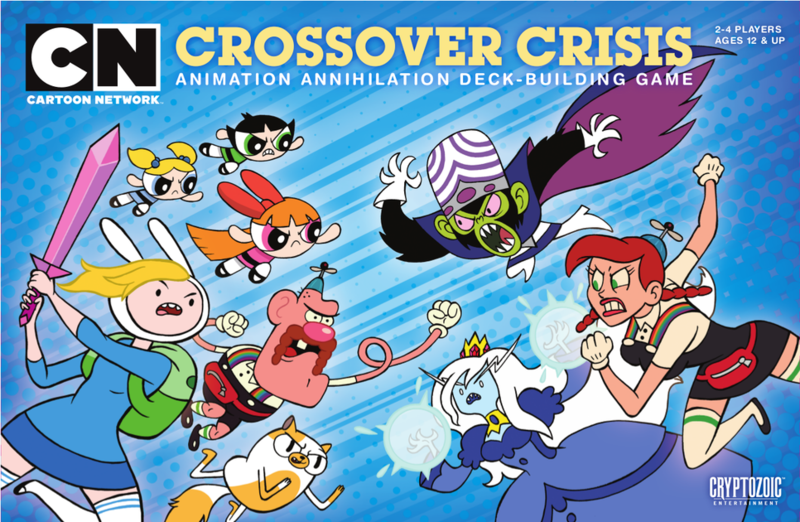 Cartoon Network Crossover Crisis: Animation Annihilation is a standalone game as well as an expansion for Cartoon Network Crossover Crisis by Matt Dunn, published by Crytozoic Entertainment. It is for 2-4 players. This expansion adds new Nemesis, Event and Main Deck cards, as well as all new Oversized Character cards to play as. For more information on the original Cartoon Network Crossover Crisis game, please check out the link at the bottom of the review. Before I get into all of the new cards that this expansion adds to the game, I’d like to take a few moments to go over how to set up and play the game. As I said, this expansion can be played both with the original game and by itself. I will discuss adding both this expansion and the main game in the gameplay section below. For now, I’ll simply cover setting up and playing this expansion by itself. To begin, each player may be dealt a random Oversized Character card, dealt two random cards or they may simply choose their favorite character to play. As long as each player has a single Oversized Character card, it’s fine. The card is placed face up in front of the player. Each player is then given 7 Punchies and 3 Pratfall cards. These cards are shuffled together and make up each player’s starting deck. The Event cards are added to the Main Deck which is then shuffled together. The Main Deck is then placed face down in the middle of the play area. The Kanker Sisters Nemesis card is set aside for the moment. The remaining Nemesis cards are then shuffled together before being placed face down across from the Main Deck in the middle of the play area. The Kanker Sisters card is then placed on top of the face down stack. The top 5 cards from the Main Deck are placed side by side beside the deck in a row called the Line Up. The Inside Joke and Weakness cards are placed in separate stacks above and below the Nemesis cards stack. It should be noted that if there is more than 1 Event card face up in the Line Up, the additional Event cards should be removed from the game and replaced with cards from the Main Deck until there’s only 1 Event card face up. Each player will now draw 5 cards from their deck. The first player is chosen and play now begins. On a player’s turn, they will be able to play as many cards from their hand as they would like. It should be noted that Weakness cards must be played first before any other cards. Each time a card is played, it’s text is resolved immediately. Many times the player will gain Power which is then used to purchase cards from the Line Up, Nemesis stack or Inside Joke stack. Any bought or gained cards are placed face up in the player’s discard pile. Once a player has finished playing cards and making purchases, they will announce the end of their turn. Any remaining cards in the player’s hand are placed into their discard pile. Any end of turn effects are resolved at this time. Any cards that were played are now placed into the player’s discard pile. Any unspent Power is lost at this time. Five cards are then drawn from the player’s deck. If there aren’t enough cards to draw five, the player’s discard pile is shuffled to create a new face down deck. The remaining cards are then drawn. If the top card of the Nemesis stack is face down, it is now flipped face up. The card’s Group Attack is read aloud and resolved. Play then passes to the next player in turn order. The game continues until one of two conditions is met. If there are no more Nemesis cards left to flip up new card, then the game ends. If there aren’t enough cards to refill the Line Up back to 5 cards, then the game ends. All of the Location cards, cards in the player’s hand and discard pile are returned to the player’s deck. Each player will then total up the Victory Points on the cards in their deck. The player with the most points is the winner. Now with a good grasp of the rules, what all does this expansion add to the game. Well to begin with there are 6 new playable characters, including the Powerpuff Girls, Uncle Grandpa, Cow and Chicken, Billy & Mandy, Fionna & Cake and Ed, Edd n Eddy. There are also new Weakness cards, Event cards, Main Deck cards and Nemesis cards. All of these feature characters, locations and other things associated with the shows from Cartoon Network that feature the previously mentioned characters. Gone is the keyword of Rock, Paper, Scissors…enter the new keyword Wonder. Wonder simply means that the player reveals cards from the top of the main deck until they reveal a non-Event, non-Location card. The player then plays that card, gaining any benefits from it, before placing it into the Line Up. Any other revealed cards are placed on the bottom of the main deck. As mentioned earlier, there are plenty of new cards included with this expansion to add to the orginal game. There are the 6 new characters that come with the game. I love having Cow and Chicken as well as Ed, Edd and Eddy. Of course my daughter really loves Fiona and Cake and the Powerpuff Girls. No surprise there. The new Weakness cards introduce a lot of new surprises as do the Event cards. There’s also plenty of new artwork for the regular cards like the Pratfalls, Punchies and Inside Jokes. 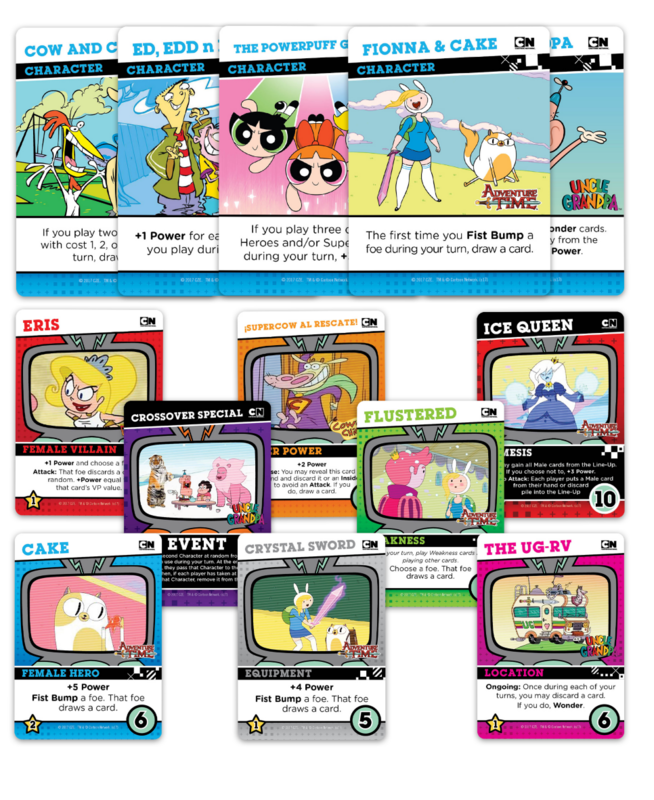 As I mentioned before, each of the highlighted cartoon worlds are represented in the different Nemesis cards, Locations, Hero cards, Villains, Super Powers and Equipment cards. There does seem to be fewer cards in this as opposed to the base game. Of course there’s still plenty of cards to play with without even needing the base game. However for us, we love being able to add all the new material with the main game for a massive royal rumble of epic proportions. The artwork is really great and has plenty of screen captures from the various shows that each one represents. I think that overall everything looks good and that it provides plenty of stuff to make the kids happy. That makes me happy. The rulebook for this expansion is the same size as the large rulebook included with the base game. That’s pretty much the same as those of all the large box Cerberus Engine card games too. There’s plenty of great looking pictures and examples throughout the book. Everything is explained really well and it’s easy to read and understand. There are break downs of each of the main card types with explanations of what they are and what they do. There’s a great section that explains the different keywords that this game introduces as well as discussing the ones that had also been a part of the first game. There’s also a section describing how to combine this expansion with the base game. That’s the part that I’m most happy with. The book also clarifies several different cards, as well as providing a nice section for frequently asked questions. Overall I find that the rulebook follows a set pattern that has been seen in both the previous rulebook as well as those of all the Cerberus Engine games. That pattern seems to work, so why stop using it. I think everything here looks great. I’ve really enjoyed all of the different cartoons on Cartoon Network over the years. I’ve been especially fond of shows like Ed, Edd n Eddy and Cow and Chicken. My son especially liked those as he was growing up. We’ve also enjoyed Courage the Cowardly Dog and Adventure Time, but that’s a different story. Now as my daughter has been starting to watch some of these older shows as well as some of the newer stuff like Uncle Grandpa and Adventure Time with Fiona and Cake, she’s started enjoying some of the same shows that my son and I did. Enter this expansion. We’ve already enjoyed the first game but other than Dee Dee, my daughter didn’t really have a wealth of characters that she felt comfortable playing. Of course she liked finding the different Crystal Gems from Steven Universe in the first game, but that’s a different review. This game gave us Fiona & Cake and the Powerpuff Girls. Not to mention the combos of Billy & Mandy and Cow and Chicken. Both of which include girl characters. In case you were wondering. You can’t believe the excitement my daughter had when she was able to play as these new characters in a game system that she already enjoyed. We’ve played the DC Deck Building game several times, but she seems a bit disconnected some times with that one. With this game, it features characters that are right up her alley. Characters from shows that she watches regularly and truly enjoys. It adds lots of new material to an already great game system in the Cerberus engine. Needless to say, we like this one a lot. The new characters are great and the new keywords are fun to use. Have to say, I got sick of the rock, paper, scissors from the first one. This one is a bit more fun in my opinion. Of course the best part is that if you already own the base game, you can combine it with this expansion to create an awesome fusion. Kind of like when all the lions come together to form Voltron. When combining the games you can use characters from both games. However you’ll only be using 15 of the Event cards with the combined Main Decks though. You’ll also use 7 or less Nemesis cards along with either the Kanker Sisters of the Ice King from the first game. The exact number will be dependent on the number of players. Other than that, everything plays pretty much the same. Fans of the original Cartoon Network Crossover Crisis will love this expansion. Deck Building fans with young kids will definitely enjoy this either by itself or with the first game. Needless to say, my daughter and I really enjoy it. I would definitely recommend it as a family game or for playing with the kids. It’s a lot of fun. Cartoon Network Crossover Crisis: Animation Annihilation is an expansion for the Cartoon Network Crossover Crisis game, as well as being a stand alone game. It adds 6 new characters, new Events, new Weaknesses, new Main Deck cards and new Nemesis cards. It focuses on characters and things from the featured shows of the Powerpuff Girls, Uncle Grandpa, Cow and Chicken, Billy & Mandy, Ed, Edd n Eddy and Adventure Time with Fiona & Cake. Play time remains pretty much the same with most games lasting around 30 minutes or so. The cards are great and my daughter and I both love the artwork on them. The game works great both as a stand alone game or combined with the original game. I like that the rock, paper, scissors keyword has been replaced with the new Wonder keyword. Fans of the featured shows will really enjoy this game, as will fans of the original Cartoon Network Crossover Crisis. This is a great game to be played with kids or families. It provides plenty of player interaction and will make you laugh. We’ve really enjoyed it and look forward to playing it a lot more. Stop Wondering, it’s good fun. This entry was posted in Reviews and tagged animation, animation annihilation, annihilation, board, board games, card, card games, cartoon, cartoon network, crisis, crossover, crossover crisis, cryptozoic, cryptozoic entertainment, dunn, entertainment, games, matt, matt dunn, network. Bookmark the permalink.